Due to the dynamic changes in the battlefield and the necessity of a potent 7.62mm cartridge weapon with superior performance, granting the troops an innovative, powerful, accurate and reliable weapon that can be rapidly and easily deployed in all combat situations- IWI created the TAVOR 7 7.62X51mm Assault Rifle. TAVOR 7 is a bullpup configuration system – rear center of gravity enabling a rapid acquisition of the target and providing the ability to fire the weapon with only one hand. Furthermore, due to the bullpup configuration, the weapon’s overall length can be significantly reduced without modifying the barrel length, allowing maneuverability in CQB / confined spaces and at the same time, being lethal for long ranges. 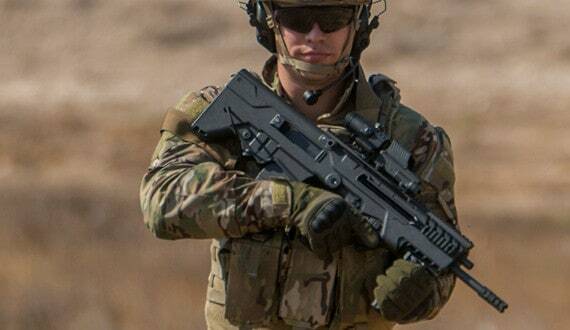 TAVOR 7 is a battle ready innovative weapon, built to be durable and robust, designed in close collaboration with the IDF to create a weapon with outstanding performance and accuracy in all environmental conditions with enhanced human ergonomics. TAVOR 7 is made of superior steel and high strength impact modified polymer; it has a rotating bolt system ensuring maximum safety for the user. TAVOR 7 can be easily adapted, depending on the operational requirements, military or law enforcement tasks – vehicle patrol & use, CQB & confined spaces, under cover missions – short and medium combat engagement, custom police operations, VIP protection, etc. TAVOR 7 is a fully ambidextrous platform; the ejection side can be swapped rapidly and easily from side to side by the user. It is equipped with mil standard 1913 Picatinny rails on all sides allowing 100% compatibility with any available sights and/or accessories.